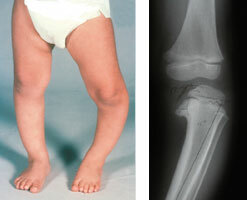 Is a growth disorder of the tibia (shin bone) that causes the lower leg to angle inward, resembling a bowleg. Occurs in young children and adolescents. Cause is unknown but is thought to be related to weight-related effects on the growth plate. The inner part of the tibia, just below the knee fails to develop normally, causing angulation of the bone. The disease is progressive and the condition worsens. It can cause severe bowing of legs and can affect one or both legs. Associated with obesity and early walking. Exaggerated the impact of physiologic bowing. Increase the stress placed on the physis of proximal tibia. Angling of proximal end of the tibia of about 10 to 20. Decrease in height of the medial tibial growth plate. Encourage weight loss for over weight children. Encourage active/ isometric exercises for upper torso and unaffected limbs. Help patient continue preoperative muscle exercises as able or when allowed out of bed. Demonstrate or assist with transfer techniques ad use of mobility aids. Assist with specified range of motion exercises for both affected an unaffected limbs beginning early in postoperative stage. Support psychological and physiological adjustments. Promote mobility and functional abilities. 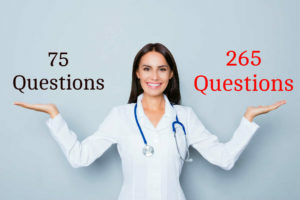 Provide information about surgical procedure or prognosis and treatment needs. Encourage expression of fears, negative feelings and grief regarding his condition. Provide open environment for patient to discuss concerns about sexuality. Promote or provide general comfort measures. Encourage continuation of postoperative exercise program. Discuss various medications that may be used for pain management. Stress importance of well balanced diet and adequate fluid intake. This entry was posted in Maternal and Child Health Nursing and tagged shin bone injury, tibia vara. Bookmark the permalink.